Since early last century, people have been travelling to Two Rocks to enjoy its pristine beaches and fertile fishing grounds. In later years, once the area was connected to the Perth road network, Two Rocks became home to scores of holiday shacks. Today, looking back, Two Rocks has had a very interesting history. The area was named after two prominent rocks that are located near Wreck Point and Two Rocks was gazetted as an official Perth suburb name in 1975. The Two Rocks area really came to prominence in the early 1970s when Perth entrepreneur Alan Bond purchased around 20,000 acres of land north of Yanchep. 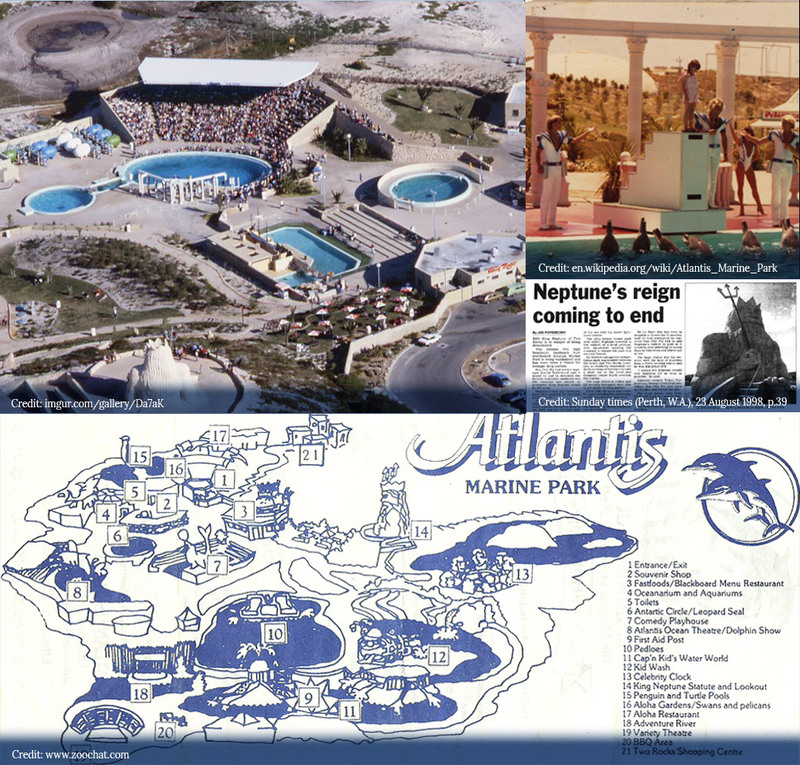 His plan was to create a significant resort and residential area that would benefit from the rapid expansion of Perth’s population – and this culminated in the construction of Atlantis Marine Park in 1981. Six months before the Park opened, seven bottlenose dolphins were captured nearby and, once trained, became the central attraction at the Park. The Atlantis Marine Park was designed to resemble a Roman amphitheatre, complete with Roman columns and tiered seating. The Park was opened by the then premier Ray O’Connor and the chairman and president of Tokyu Corporation Noburu Gotoh. 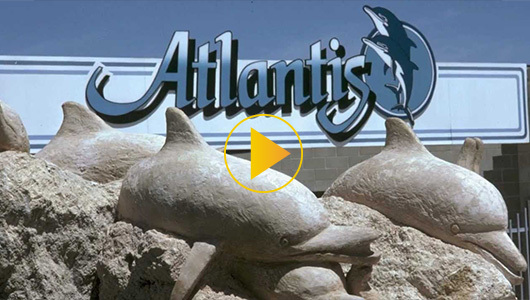 The establishment of the Atlantis Marine Park was the first step for Yanchep Sun City to be expanded into a world-class leisure and recreational attraction. Then, in 1988, three female dolphin calves were born at the Park and this resulted in regulatory changes in how marine mammals could be held in captivity. These changes meant that the Park operators were required to construct a larger enclosure for the dolphins. This expenditure, combined with falling visitor numbers, lead to the Park’s closure in 1990. From an international perspective, Two Rocks really came into its own thanks to the 1987 America’s Cup challenge. Alan Bond and others built the Two Rocks Marina as a construction and training headquarters for the America’s Cup – and to also provide facilities for the local fishing industry and boating enthusiasts. Today, the Two Rocks Marina is still a hive of activity and approval has been given for a $6 million upgrade of the complex. The Sun City Yacht Club was also established by Alan Bond in the 1970s. Mr Bond’s father and uncle were both closely associated with the early development of the Club and Mr Bond’s brother John was the Club’s first commodore. 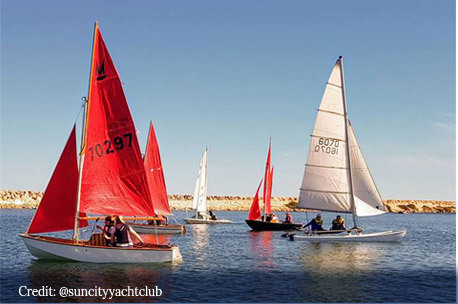 The Sun City Yacht Club is still extremely popular today and offers people of all ages a calendar of water-based activities. Everyone knows the iconic King Neptune statue that sits up high on a hill overlooking Two Rocks. 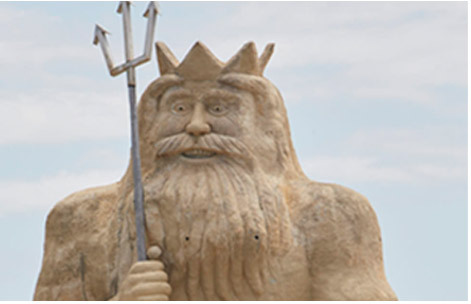 After years of neglect and vandalism, the developers of Atlantis Beach along with a local landowner funded the repair and refurbishment of King Neptune. It took 11 men two weeks and 70 litres of paint and the King has never looked better.